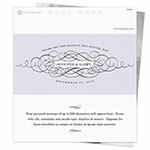 Fashionable scrolls adorn this simply elegant wedding design. Design: Ornate swirls surrounding a name plaque. Personalization: Front message, names, date and back message.